Neither the meal nor the day turned out quite as I had hoped – Mother Nature interfered in a number of ways, beginning with the ill-timed disappearance of our resident mama cat and her consort (just before we were scheduled to take them in to be fixed), and culminating with the strange weather that blew through last evening. We wanted to grill, we kept checking the skies and the satellite maps hoping we could squeeze it in between bursts of rain and lightning, and when what we thought was a good opportunity came, we jumped. The chimney starter lit, coals glowing red, and wouldn’t you know it, we had to scurry back indoors as lightning flashed overhead. Maddening. But we had committed. Our fire burned strong through the burst of rain and when the clouds passed, we rushed to get our food on the grill. 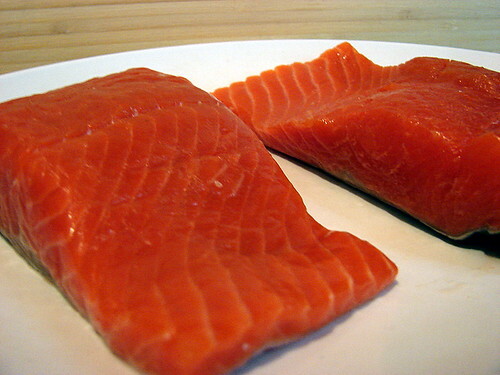 We have been stockpiling Copper River salmon in our freezer so we can stretch out its short season, and I had thawed two filets for our meal. I seasoned them with nothing more than a healthy amount of kosher salt and some olive oil, and Mike grilled them skin side down over indirect heat for about 8-10 minutes. I’ve been eager to try this recipe for grilled fava bean pods, so when Mike was able to get some on Monday, I earmarked them for this meal. We placed the whole fava bean pods on the hot side of the grill until they were charred, then I tossed them with olive oil, chile flakes and kosher salt. Somehow we were out of lemons (this never happens at our place), so I added a little bit of sherry vinegar for acidity, and I used chopped spring onion tops instead of the scallions called for in the original recipe. 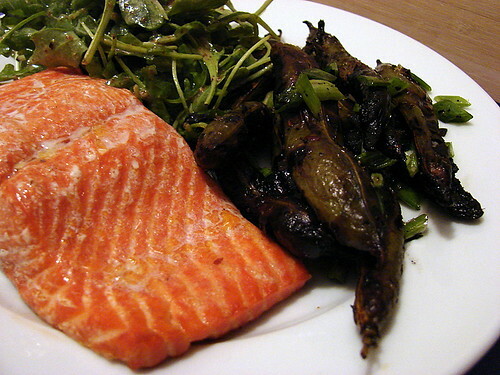 I tossed some baby wild arugula with a mustard vinaigrette to go along with the salmon and favas. I was mostly pleased with this meal, though I do think we left the favas on the grill a couple of minutes too long. Some of the pods got really black and weren’t particularly tasty, though the ones that were less charred and still showed a bit of green were quite nice. The beans themselves were delicious, creamy with a smoky, nutty flavor. When we do this again, I think we’ll still char the whole pods, but then I’ll pop the beans out of the pods and toss them with the vinaigrette – it’s a nice combination of flavors.